I’ve always tended to look with favor on new Jaguars, even when they didn’t deserve such recognition. You don’t have to go all that far back to come to a time when their technology (i.e., navigation and audio systems and the operation thereof) was at least a half-step, if not a full pace, behind that of their competitors, and they were late coming to market with convertibles with tops that automatically folded neatly into an enclosed compartment instead of requiring you to get out and snap in place a tonneau cover. And then there were the issues like about how Aunt Jane once had a Jaguar and it was always in the shop. But since Tata Motors bought the famed Brit brand from Ford in 2008, Jaguar seems to have undergone a product revitalization, an example of which is the F-Type coupe and convertible introduced in 2014 and featured in current television ads. The droptop is unquestionably my favorite Jaguar and one of my favorite luxury cars period. But Tata didn’t stop there. With the 2017 Jaguar XE, the company dives into the thick of the compact luxury sedan segment by taking on the traditional leader of the class, BMW’s 3 Series, along with the Mercedes-Benz C-Class, Audi A4, and others. If you’re tired of browsing in Teutonic showrooms, the XE gives you a good reason to shop around. The XE comes in four trim levels (Base, Premium, Prestige, and R-Sport) and with three different engines offered for each, starting with a 2.0-liter turbocharged four-cylinder (240 horsepower, 251pound-feet of torque) and including a 2.0-liter turbodiesel (180 hp, 318 lb.-ft). All the engines are mated with an eight-speed automatic transmission that can be manually shifted via steering wheel-mounted paddles or put in Sport mode for some extra punch. Fuel efficiency for the four-banger is listed as 21 miles-per-gallon city, 30 highway, and 24 combined. For the 35t, it’s the same with RWD models and 20/29/23 with AWD. Jaguar hasn’t released numbers for the diesel and they aren’t available at www.fueleconomy.gov, but they’re expected to be better than those for the gasoline models. I’ve always liked the exterior styling of Jaguars. They have a very distinctive look about them that sets them apart from their competitors. You never have to check out the badging to confirm it’s a Jaguar. That’s certainly true with the 2017 XE. Though it doesn’t have traditional Jaguar cat leaping from the hood — the company opted instead to go with its other signature logo, the Growler, in the front grille, the all-new XE isn’t going to be confused with any other make from any other manufacturer. 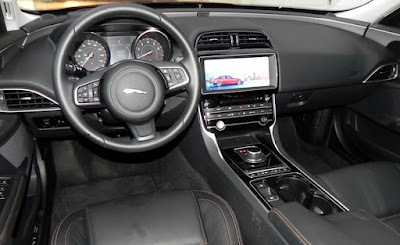 Inside, the Jaguar XE has a distinctive look as well, thanks in part to the rotary dial gear selector that rises from the center console when the start/stop button is pushed. The cabin is uncluttered, which is both good and bad. It takes a bit of time to get used to how the various infotainment features are operated, and the navigation map kept asked me to log in to my account, which I didn’t have. Response to voice commands was about average. Overall, though, the systems aren’t overly complicated to operate, and they’re a big improvement over what Jaguar offered a decade or so ago. The ambiance of the interior is very classy, and the front seat is rather cozy. The backseat? Well, three passengers supposedly fit back there, but I’d hate to be the person in the middle. Truck space is on the generous side with a capacity of 15.9 cubic feet. 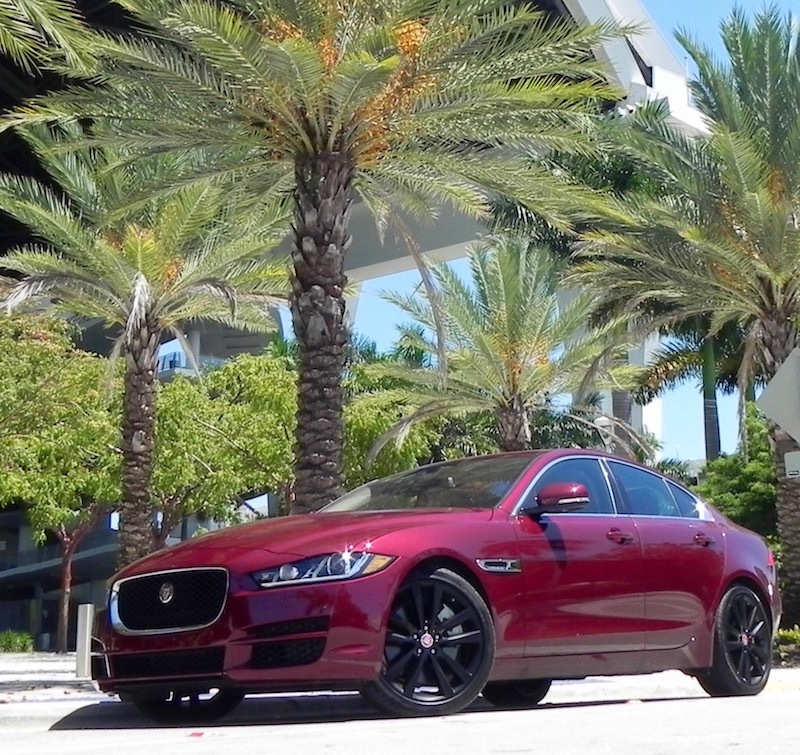 Pricing for the XE 25t (2.0 turbo) starts at $34,900. MSRP for the diesel version is $36,400. The 35t (3.0 supercharged) starts at $41,700. The 35t Prestige model I had included optional Vision (HID headlights, headlight power wash, high beat assist, front and rear park assist, blind spot detection and reverse traffic detection) and Technology (10.2-inch touchscreen, navigation, surround sound, and Wi-Fi) packages with a base price of $45,600. Add the destination and delivery and total charges were $46,595. 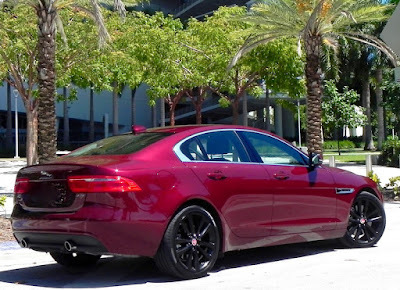 What I liked about the 2017 Jaguar XE 35t Prestige: It’s beautiful on the outside and comfortable on the inside. Especially when set in Dynamic and Sport mode, its responses are quick and deliver a true sports sedan performance. What I didn’t like about the 2017 Jaguar XE 35t Prestige: The infotainment system could be simpler to operate. A dial to flip through radio stations, for instance, would be a good addition. Somehow, I hit something that turned off the radio, and it took a while to figure out how to get it back on. Kind of reminded me of the time several years back and I accidentally turned off the audio on a BMW and I ended up pulling over and stopping the car and turning off the engine to start all over to get it back on. Would I buy this car: Yes. It’s at least worth a look, especially if you are looking for something distinct from the usual BMW-Mercedes-Audi mold. 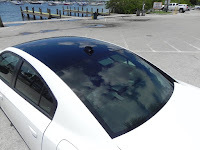 One of the last reviews I wrote for examiner.com this summer was on the Dodge Charger Hellcat. This is the vehicle that dropped a virtual nuclear bomb in the horsepower wars a couple of years ago by putting a 6.2-liter supercharged Hemi V8 under the Charger’s hood. At 707 horsepower, it became the most powerful sedan in the world. With 650 pound-feet of available torque, the Hellcat zips from zero-to-60 mph in well under four seconds, and the website torquenews.com has reported a time actually quicker than that — just 2.9 seconds. Of course, there was more to the review than horsepower numbers and I really would like to give you a link to it. When they pulled the plug on examiner.com recently, however, they really pulled the plug and it’s not available any more. Maybe the Russians can find it. 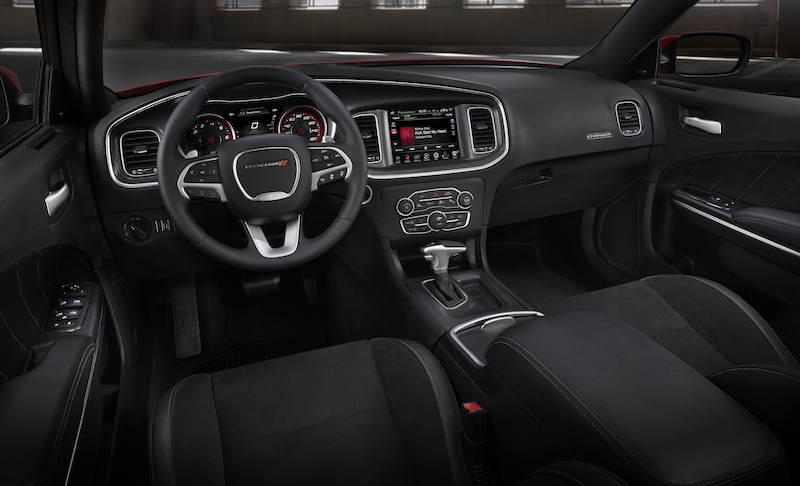 The Charger Hellcat is well-equipped with lots of extras thrown in and roomy as well. 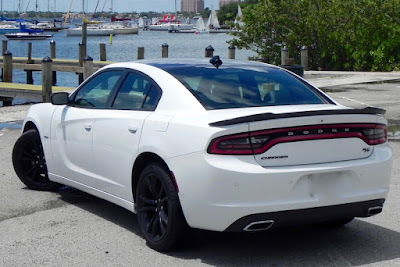 One thing I noted in my review was that even with all those power, the Hellcat with its five-passenger capacity still could serve as a “family car,” though one not particularly fuel efficient. 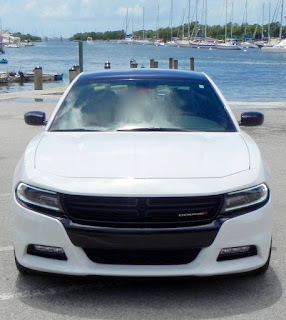 But it also carries a base price tag of nearly $66,000 which, let’s face it, is a lot of money for a Dodge no matter how refined and fast it may be. But you don’t have to spend that much to get the Charger’s Muscle Car looks and performance that lives up to the image. Take the Charger R/T Blacktop I had this past week. Fuel consumption for the 5.7-liter HEMI is rated at 16 miles-per-gallon city, 25 highway, and 19 combined, which according to the car’s computer is right at the numbers I was getting for my week. Mid-grade fuel is recommended, but Dodge says that regular is acceptable. Numbers for the Hellcat are 13/22 and premium fuel is recommended, so you come out a little ahead there as well. All the engines, by the way, are mated to an eight-speed automatic transmission with manual gear selection capable via steering wheel-mounted paddles. 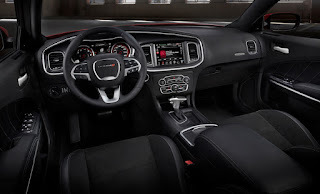 The R/T comes with a pretty wide variety of standard features, like anti-lock disc performance brakes, sport suspension, electronic stability and traction control, hill start assist, automatic headlamps, keyless Go system with push-button start, Dodge’s UConnect system with an 8.4-inch screen to operate telematic funcions, voice commands, and dual zone A/C. My test vehicle had some option packages that added such features as a Beats Premium sound system, leather seats, HID projector headlamps, ventilated front seats and heated second-row seats, rear backup camera, park-assist system, and the Blacktop appearance package that features 20-inch polished and black painted aluminum wheels, black trim touches inside and out, navigation, and a leather-wrapped performance steering wheel. Oh. And a black painted roof. That ran the total MSRP to $41,070, which is still quite a bit less than what the Hellcat will set you back. Can you accept getting to 60 mph a couple of seconds slower? I can for that. What I liked about the 2016 Dodge Charger R/T Blacktop: The looks are outstanding, and the performance is among the best, and not just in power. Handling is very nimble, and the quiet ride is firm but not overly stiff. 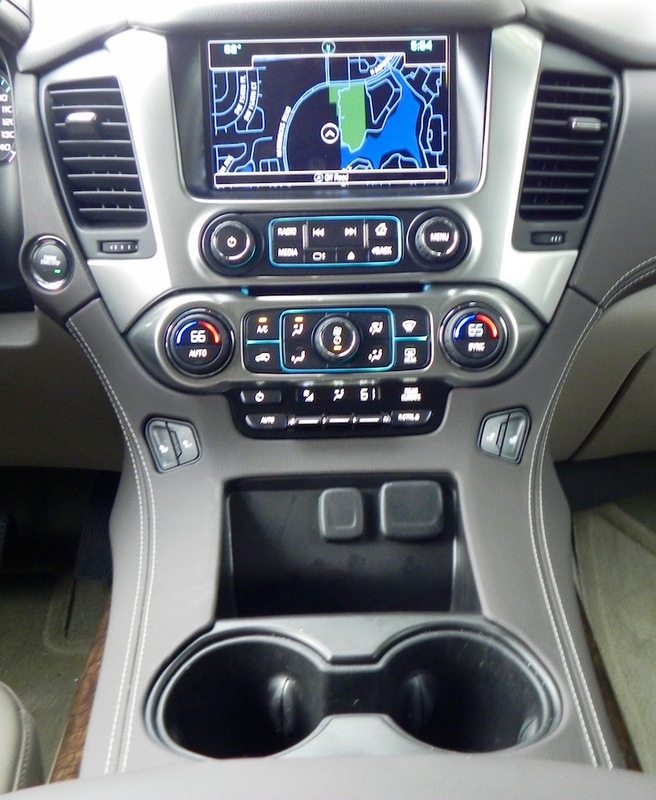 The interior has been seriously upgraded with the cheap plastics of past cabins long gone. Backseat passengers can get 40.1 inches of legroom, only 1.7 inches less than those in the front. Trunk capacity is 16.5 cubic feet, which matches what you find in most others in the segment, including the Chrysler 300. Navigation, audio, etc. are very easy to operate. What I didn’t like about the 2016 Dodger Charger RT Blacktop: Visibility is somewhat restricted by the large rear pillars and small rear windows. Seats could provide more support. A little more in the way of fuel economy would be nice, but if you want that performance, you’ve got to sacrifice something. Would I buy this car: Yes. 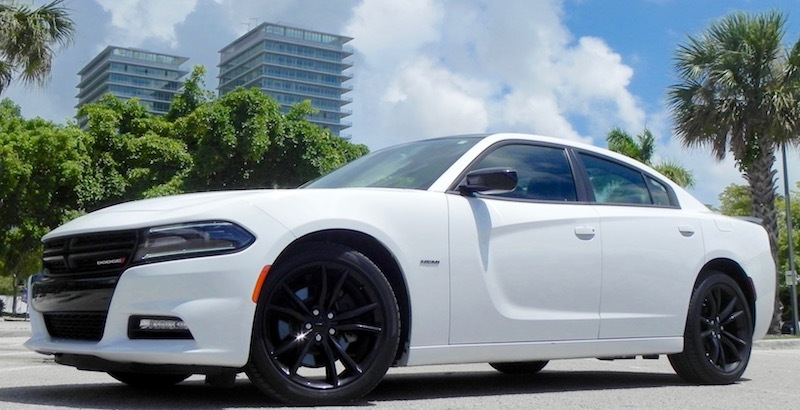 The R/T is as fun to drive as the Hellcat (more economical, too) and leaves you a lot more money to spend on extras. A PR rep for an auto manufacturer a few years ago said that after she had moved from St. Louis to Nashville she was stopped behind a car at an intersection and when the car didn’t move when the light changed, she honked her horn. Another friend overheard the story and laughed. Would you believe I don’t honk because I’m such a nice guy and very patient? OK. Maybe not. Well, really the thing is, so many other things annoy me when I’m driving in South Florida that someone who lingers at a light is way down on my list. —Drivers who don’t use their turn signals. As you can see from the above photo, the state or county has embarked on a campaign to try to remind drivers about various safety regulations in Florida via electronic signs above the roadway. 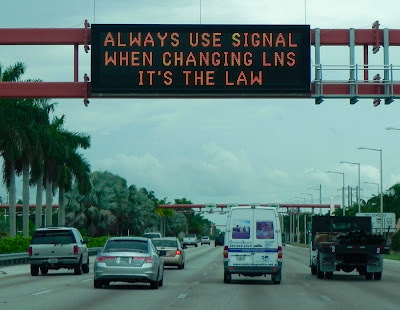 Last week it was a reminder to signal when changing lanes. Considering some people don’t use their turn signals to let you know when they are making a left turn and hardly any at all do so on a right turn, I’d say this is a fruitless campaign. Signal when changing lanes? What a radical idea! This week the electronic reminder concerns moving vehicle from traffic lanes in the case of minor accidents with no injuries. It doesn’t take long for traffic to back up when one lane is blocked, and it makes no sense to leave your vehicle in the middle of the street if the damage is little. Believe me. Your fender-bender may be big for you, but for the police, it’s trivial to what they face nearly every day. You’re lucky they look at your driver’s license. —Drivers who turn on their flashers when it’s raining. Like the requirement to use signal when changing lanes, it is a state law that you do NOT turn on your hazard lights while you are driving when it is raining. Yet many drivers in South Florida do exactly that, especially in heavy rain. State law limits the use of hazard lights (it’s the button with the red triangle that you push) is limited in Florida to emergency situations when you are stopped or stalled. The one time in the state you are allowed to turn on your flashers is when you are driving in a funeral procession. Turn them on other times and you may just end up in one. —Drivers who honk when traffic is stopped and backed up. There’s an old joke that a guy was stopped at an intersection waiting to allow a little old lady make her way slowly across the street and a guy behind him honked. —People talking on their cell phones while driving. I’ll bet that 90 percent of the time someone in front of me does something stupid, like swerve out of a lane or gradually slow down before making an abrupt turn (without signaling), that person is holding a cell phone up to his/her ear while driving. Texting, of course, is even worse. —Drivers who hang in the left lane on expressways. The left lane on expressways should be for passing, though I guess there are exceptions in urban areas. I know Kentucky is among states that have passed laws limiting the left lane for passing because there are signs along interstates in the Bluegrass State informing drivers to move to the right except when passing. 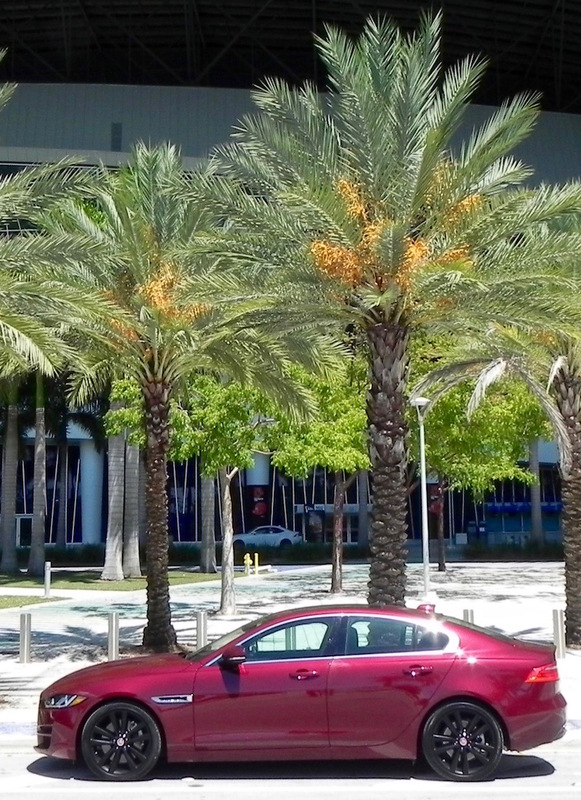 Florida has tinkered with that idea and at least once the state legislature has passed it, but Jeb Bush, the governor at the time, vetoed it because, he said, he didn’t want to encourage speeding. As if anybody in the left lane goes the speed limit. —Drivers who follow too closely. Tailgating is great — at football games. On the interstate or even around town, not so much. The problem is there’s not a lot that you, the one being tailgated, can do about it. Sometimes I tap my brakes, but frankly that’s probably not a very good idea. Just ticks them off. There are other things have can be annoying, but I have listed the major ones. At least for me. Maybe for you the driver who fails to see that the light has turned green and just sits motionless is at the top of your list. I am running a day or so late on my usual auto review blog, but I have a good reason/excuse. On Monday of this week I had a problem with my laptop’s keyboard. A string of keys in the middle row (from D to L) simply failed to work. Punch them and nothing would happen. Naturally, I had a bunch of college football reports that were due the next day (these things never happen at a convenient time), and though I had done most of the work, some more still needed to be done. So I took my laptop to a computer fix-it place and there, not to my surprise, I was told I would need a new keyboard. If they had one at the shop, they could fix it rather quickly. If they didn't, it probably would be Wednesday afternoon. Naturally, they didn't have the keyboard in house. I left my computer there (What choice did I have?) and went to the library to see what work I could do there as far using their computers. I don’t know if you have ever experienced trying to work on a PC after years of dealing with a Mac, but I can assure you of this: It can be frustrating. Very frustrating. So I got little work done that evening. Fortunately, the people I was to file the reports to said I could send them on Wednesday, so that left me worrying only about whether the fix-it people would be able to get my laptop back to me as they had said. And, bless their hearts, around 2 o’clock I got a call that it was ready. I zipped over there to pick it up. While there, they asked me if I had a pet. It turns out they found a bunch of cat hair when they opened up my laptop. Gee. I wonder where that came from? Any way, I was able to finish my work in an hour or so and got my reports to the Sports Xchange people apparently in plenty of time. At least they’re not complaining. I had been planning to get to my usual car review on Wednesday but with that day taken up with my football reports, I couldn’t. And Thursday I had other things that needed to be taken care of. Thus, I am writing my car review today (Friday), and even now it is late afternoon. My review is on the 2016 Chevrolet Suburban LT, a full-size SUV if there ever was one. Driving this for a week took me back to the late 1980s and 1990s when I had a Ford E150 full-size conversion van as my family vehicle. With the Suburban, you have a feeling of get-the-hell-out-my-way power that comes with driving a vehicle that’s almost as long as Sherman tank tempered by the fear that somehow you’re going to unknowingly run over a Fiat 500 in a strip mall parking lot. 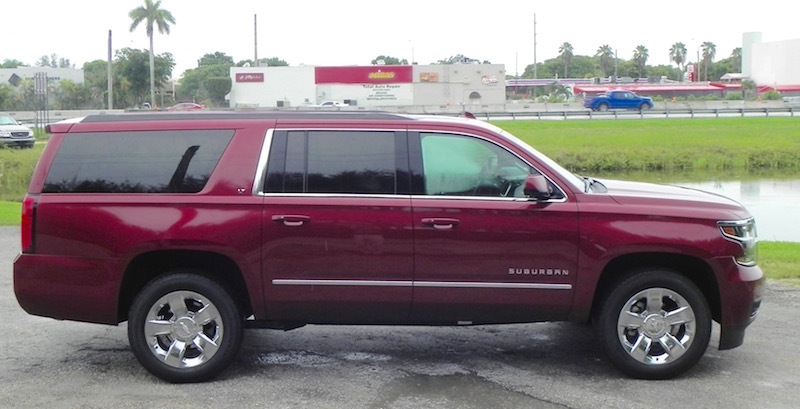 Of course, the Suburban handles much better than the Sherman. (If you don’t believe me, just ask Mr. Peabody.) Rim shot! Something you might not know about the Suburban. It has been around since 1935, making it the longest-running automotive nameplate in production. Available in three trims (LS, LT, and LTZ), Chevy gave it a makeover for 2015 and for 2016 has added some upgrades in the former of an Enhanced Driver Alert package (power-adjustable pedals, forward collision alert, a safety alert seat, lane-keeping assist) and headlight beams that automatically go from high-beam to low according to conditions. Power comes from a 5.3-liter V-6 engine rated at 355 horsepower (at 5600 rpm) and 383 pound-feet of torque (at 4100). It’s mated to a six-speed automatic transmission and comes in either two-wheel or four-wheel-drive configuration. Fuel mileage is rated at 16 mpg city, 23 highway in 2WD and 15/22 AWD. This is the kind of vehicle that once was thought to be on the way to extinction what with greenies getting their pants in a wad about environmental concerns, but this is far from the case. 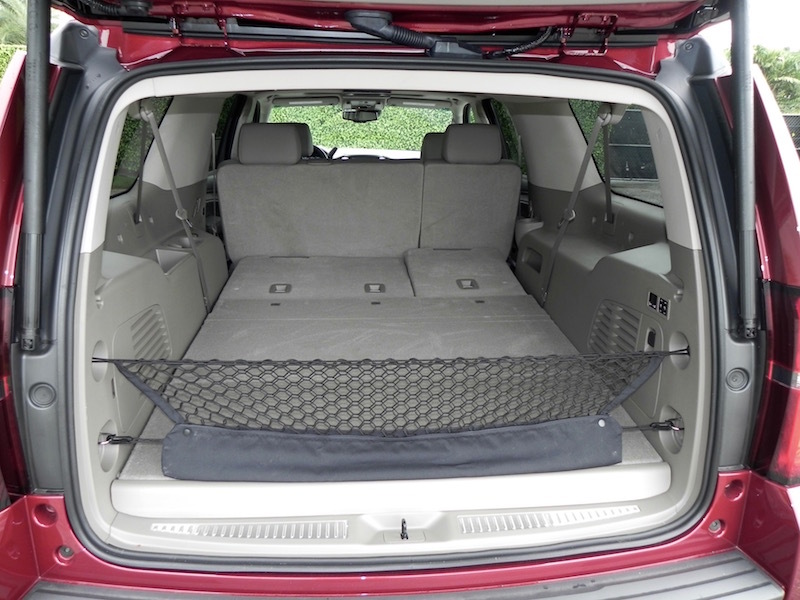 Certainly it’s not a vehicle for a family of even four members or a couple in retirement, but if you want to transport a lot of passengers in comfort with a lot of their stuff, few do it better or even more efficiently that a full-size SUV. 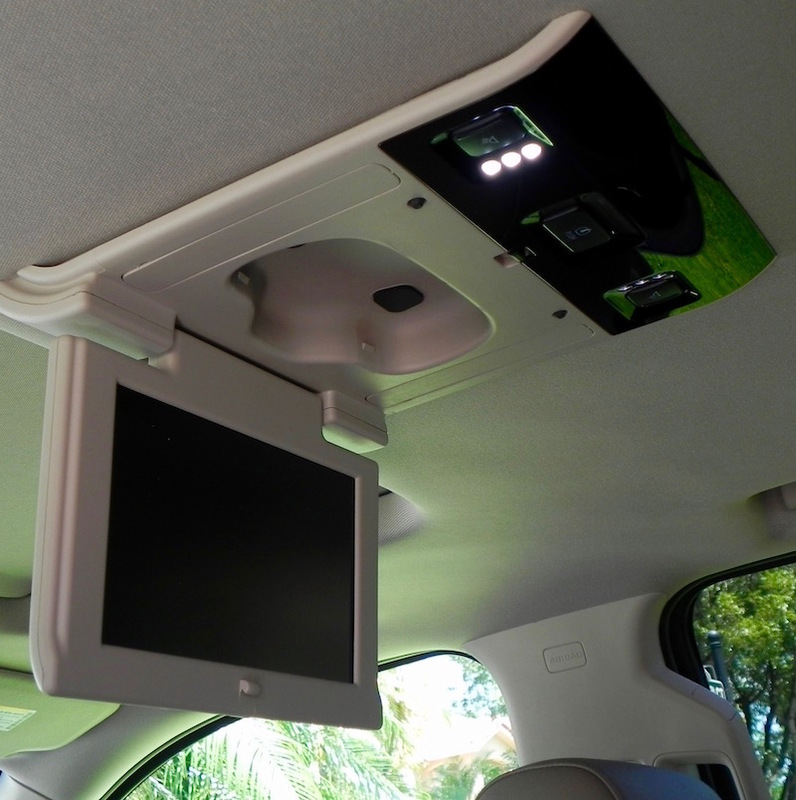 The Suburban can be fitted to seat up to nine passengers (eight is standard) and still leave good room to store items behind the third row. That third row also folds flat, leaving a whole canyon (76.7 cubic feet) of space behind the second row. 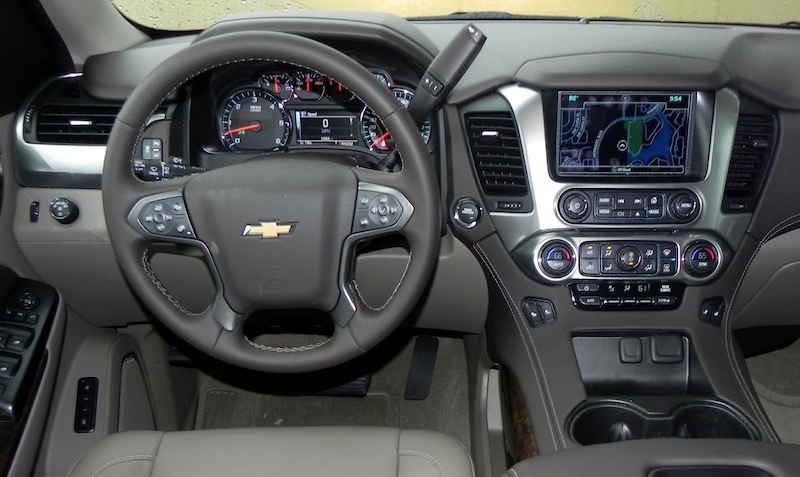 Niceties like Chevy’s MyLink infotainment system with SiriusXM satellite radio and Apple CarPlay and an available rear seat entertainment system (DVD and Blue Ray) plus upgraded materials throughout the cabin give the Suburban a more luxurious atmosphere. But it is a workhorse, too. In addition to all that storage space, towing capacity is 8,300 pounds with 2WD and 8,000 with 4WD. 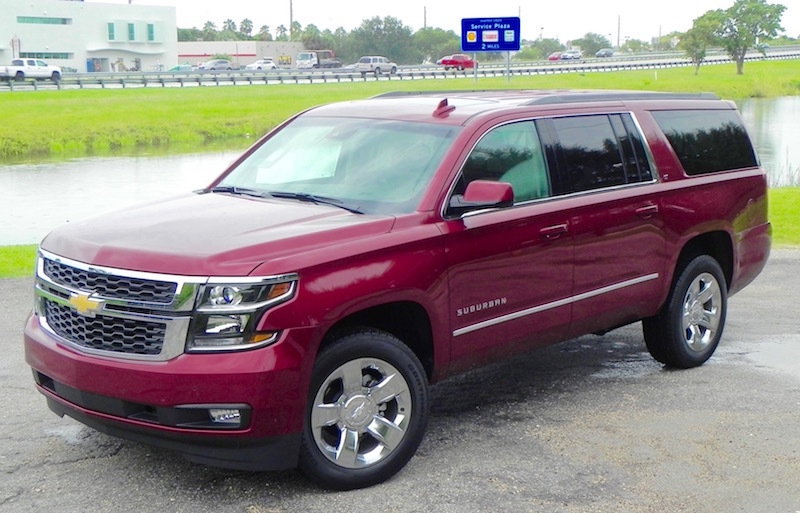 Pricing for the 2016 Chevy Suburban starts at around $50,000 and runs up to around $68,000. The Suburban LT 2WD I had for a week carried a base MSRP of $54,730 with a series of extras and the destination and delivery charge running the total tab to $65,530. 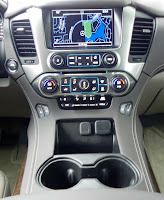 What I liked about the 2016 Chevy Suburban: The cabin is quiet and the ride very smooth. As you might expect, it’s not a jack rabbit from a standing start, but it cruises well. Materials in the cabin are first class. 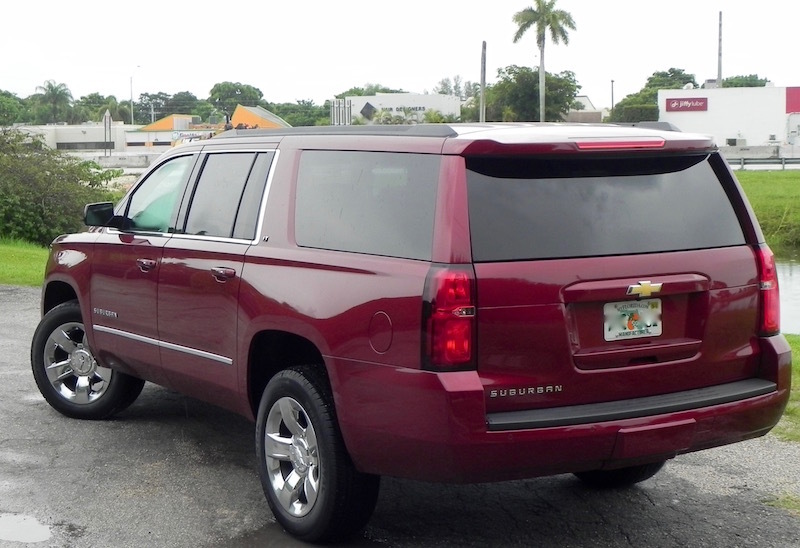 What I didn’t like about the 2016 ChevySuburban: It can be a chore to climb in and out of and standard running boards would be a nice addition. Response time on the voice commands varied. Would I buy this vehicle: Nope. But only because I don’t need a full-size SUV. If I did need one, it would be on my list to check out, but it faces some stiff competition. That includes even the Chevy Tahoe, which is not quite as big as the Suburban but has a more luxurious ambiance about it at about the same price. You may have noticed that the Olympics started this weekend. Please wake me when they’re over. I know as someone who has spent the biggest part of his life writing about sports that may sound strange (and not to mention a bit arrogant, but I don’t meant it that way. Honest.). I’m supposed to be crazy about all sports, right? But I just can’t get all that excited about the Games going on in Rio. 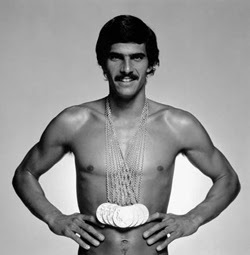 I used to watch a good part of the competitions, especially in 1972 when Mark Spitz (above) was winning beaucoup gold medals swimming for the U.S team. Spitz also swam for Indiana University and I am an IU grad. Plus I was working for a newspaper in Bloomington, Indiana, at the time. So I had an interest in how he fared. After that, my interest in the Olympics began to fade. I don’t remember much of anything about the 1976 Games (Whatever happened to that guy who won the decathlon? ), and in 1980 the U.S. didn’t even take part because of President Carter’s ill-advised decision to boycott them in protest of the Soviet Union’s war in Afghanistan. Then in 1984 the Soviet Union retaliated by staying home. In other words, the Olympics became little more than a weapon in international politics. Oddly, it seems to me that that is when they also started getting more attention in the U.S. For that, I think USA Today had a part. That newspaper was just getting started in the ’80s, and I spent some time there in 1984. That’s when the editor, Henry Freeman, who was running the sports department, made an interesting observation. Since USA Today is a national newspaper, he told me, they really didn’t have a “home” team to cover, like every other newspaper in the country. So USA Today was going to make treat the Olympics as its “home” team. And he did. Of course, television had a huge part in that growth as well. If you’ve done any channel surfing the last few days, you’ve probably run across coverage of an event on one of NBC’s many over-the-air and cable channels. They’re hard to miss. But I manage. —Tennis? Aren’t the Grand Slam events enough? —Soccer? Don’t we have the World Cup? —Air rifle? You’re kidding, right? Oh, I suppose somewhere along the line I will watch some of the different events, especially when we get to track and field. But for the most part, I kind of feel about the Olympics the same way I do about NFL exhibition games (one of which was supposed to have been played right now as I write this). I’ll stop and watch a few minutes if I run across it while channel surfing, but not much more than that. I’m not saying, by the way, that I wish the TV coverage of the Olympics would go away. Not at all. I’m not a big enough lunk not to recognize that a lot of people enjoy them. Who am I to deny them that pleasure? I have the same tolerance for the World Cup. If it floats your boat, great. Mine just sinks.